Thanks, Ken (WA4MNT), for bringing this very cool and simple project to our attention. 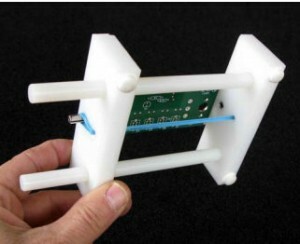 Click here to download instructions–parts are available from Ken for $23, or components can be home-brewed (I can imagine the plastic components can be replaced with wood). Check out some of Ken’s other projects at www.qrpbuilder.com. This entry was posted in Homebrew, Kits and tagged Home-brewed PCB Holder, Homebrew, wa4mnt, wa4mnt qrp projects. Bookmark the permalink.